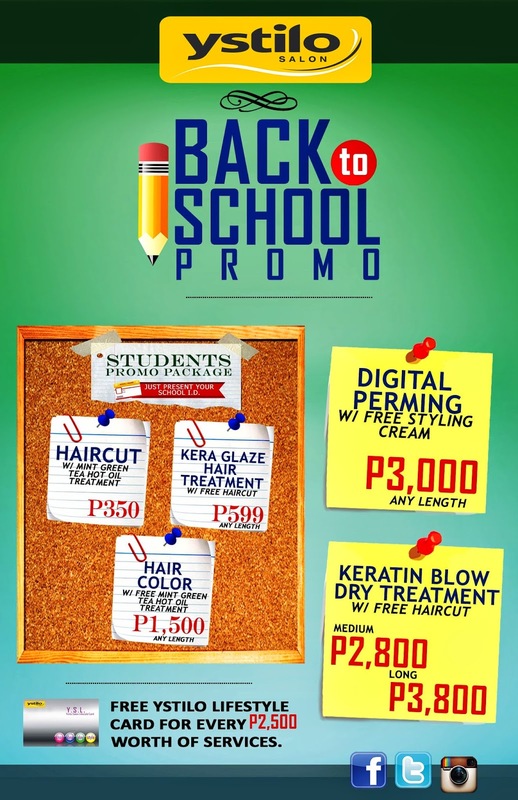 Look good all the time for prince charming may notice you with these new Ystilo Salon Back To School Promo. I've had my hair done always at Ystilo Salon SM Fairview not just to feel good about myself but because I've always enjoyed the services they offer. Having Keratin Blow Dry Treatment now comes with Free Haircut for Php2,800 (medium hair ) and Php3,800 (long hair). Girls can dazzle their crush and look like celebrities now with Ystilo Salon's Digital Perming now with Free Styling Cream for only Php3000 (any length). Haircut comes with Free Mint Green Tea Hot Oil Treatment for only Php350, Kera Glaze Hair Treatment with Free Haircut for only Php599 and Hair Color with Free Mint Green Hot Oil Treatment for only Php1,500. You also get a FREE Ystilo Lifestyle Card for every Php2,500 worth of services. Ystilo Salon is now open for franchise. Simply call (02)927-7532/425-0222 or 0927-3224210 or email them at franchise@ystilosalon.com.ph. Visit www.ystilosalon.com.ph and like their official Facebook Page at https://www.facebook.com/ystilosalon and like @ystilosalon on Instagram and Twitter for more promos and updates.